ü Choose a city or an historical site to highlight. ü Invite a guest speaker who can share something special about the places your Cub Scouts have picked to discover. ü Search on-line for the places of interest in your town to get you started. ü Plan a field trip to a local museum or public library. ü Celebrate your blue and gold banquet with local foods from your choices of the ABCs and decorate to highlight your choice. 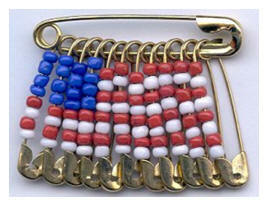 ü This would be a good month to work on the Citizenship or Geography belt loop or pin. P Feature Folk Tales from different parts of the United States and add foods from that area, a large map showing where each folk tale is based, games based on the characters or actions in the Folk Tale. For example, when focusing on Zorro, you could have boys “sword” fight with pool noodles. As a den, choose a different tale for each week, or as a Pack, have each den focus on a different Folk Tale. P America’s Heritage – A to Z Have Pack families share their family’s heritage – each family could bring a potluck dish, and artifacts or photos from their heritage. See if you can fill out every letter from A to Z in your pack – Australia to Zimbabwe?? P Go through the Alphabet with activities at your den meetings during the month: A=Advertise the Blue & Gold by making posters, B=Begin working on signing the National Anthem; C=Connect the Dots puzzle, D=Do a short service project for your Chartered Organization, etc. P Decorate with scenic posters from across America – Request from State Tourist bureaus online, check with a travel agent – these are often available at no charge on request! Another good source of beautiful posters is the Forestry Service. P Or decorate with flags from every state – you can print them from online, or get blank ones online and let the boys color them in. Go to www.infoplease.com/states.html to get state flags and profiles of each state. Also state mottos, geography. P Invite a guest expert to teach the boys how to hand sign the National Anthem, or America the Beautiful – then have the music playing in the background as the boys do the signing with their hands. P Celebrate Scout Week by doing a special service project in the community. Be sure to wear uniforms or activity shirts if appropriate, and add your service hours to the National BSA service website. P Put up a display featuring Scouting in your community – check with your local library, or ask a local retailer if you can put a display in their window. Be SURE to put up your display on time and take it down when scheduled! P Have a Window Display Contest in your community – invite other packs to find windows in local businesses where they can show off Scouting. Invite local officials to judge the displays. P Participate in Scout Sunday or Sabbath – boys and leaders can wear their uniforms, if appropriate in their religious venue. Some communities also host a special interdenominational Scout Sunday, or have a Scout Fireside on Sunday evening. Go outside and watch the weather (Achievement 5F). 1. Cut out the project foam. Use the scissors to cut out the design from the foam. Alternatively, you could trace the state onto a piece of already cut out foam, and the slide is square/diamond/circle in shape with the drawn state on it. 2. Hot glue the state quarter to the front of the foam piece. 2. Cut out the circle shape from the foam. 3. Insert the quarter into the hole in the foam (so the quarter is flush with the foam piece). 5. Glue the PVC pipe onto the foam in the back of the state. Using a map of your city, locate where you are having your den meetings. From there find and mark the following – the Court House, the police station nearest your home, a fire station near your home, the Public Libraries near your home, your school, local places of interest (bridges, parks, monuments, canals, rivers, lakes, stadiums, theatres). How about where your baseball team plays? Where did your den go on its last field trip? Try to figure out how far some of these landmarks are from where you are by adding up the miles noted on the map. How long would it take you to get there? « Give everyone a piece of paper, about 5” square. « At the signal to go, each player rips the paper, trying to make a five-pointed star. « When 30 seconds are up, the judge calls “Time” and everyone has to stop whether he is finished or not. « The judge then inspects the stars, giving a prize to the person with the best star. ü Statue of Liberty – Each Scout is given a small amount of foil in order to make a liberty torch. ü Go West Young Man –Each Cub is given a pretend horse and runs a course that is marked by orange cones. ü Crossing The Mississippi River – Swimming pool filled with water has several rocks strategically set inside; the scout crosses the pool by stepping on the rocks. ü Colorado Mines – Large cardboard boxes set up in a maze and each Cub crawls through. ü Gold Rush in California – Swimming pool filled with sand; there just might be a chance of finding gold! ü Logging In Washington – Swimming pool with 2 x 4” board inside, symbolizing the logs. Cubs pretend to be loggers, as the walk on the logs. Take a hike with your Cubs through your neighborhood, yard, or local park and ask them to try to find something that begins with a letter of the alphabet--A, B, C. This can played as teams as a scavenger hunt too. Remind your Cubs that working together as a team provides the best outcome. P Base coat the heart with white paint. P Then paint red stripes approximately 1/4 inch wide. P Paint the left upper corner of the heart blue. P Use the rounded tip of a paint brush to make the *stars* in the field of blue. P Glue suede, vinyl or PVC pipe piece ob back for loop for neckerchief. ü Draw eagle on heavy cardboard. ü Attach macaroni and straight spaghetti to cardboard with ordinary white glue. The bird’s head is left bare except for shell macaroni beak and eye. ü Elbow macaroni forms the upper wings and body. ü Apply several layers to body area. ü Complete the wings with alternating rows of spaghetti and shell macaroni. ü Cover the tail with spaghetti. ü Add shell macaroni for talons. This looks complicated but I am sure our inventive Den Leaders can see lots of ways to simplify this. 1. Drill two holes in center of stars, approximately 1/4" apart. 2. Paint stars white. Let dry. See photo. 3. Paint fingers and thumb areas of glove dark red. Let dry. 4. Stencil “U. S. A.” on center top of glove, using navy blue to stencil letters and dark red to paint periods. 5. Sew ribbons and stars on glove. 6. Cut navy blue and white ribbons in half. 7. Fold each ribbon length in half. See photo. 8. Place fold of one blue ribbon on front tip of little finger. 9. Place star on top of ribbon fold and stitch in place with needle and thread, beginning at top of one hole and ending at top of other hole. 10. Tie thread in a knot at top of star. Clip ends. 11. Repeat same for remaining fingers and thumb alternating ribbon colors. 12. Using photo as placement guide, sew five stars to front of glove band beginning at top of one hole and ending at top of another hole, tying threads in a knot at top of each star. 14. Repeat same for remaining stars for back of glove band. 15. Finish up. See photo. 16. Cut an 8" length from twine. 17. Glue each end of twine to inside sides of top of glove. 19. Thread one bell to center of one thread, tying bell to one end of hanging loop in a bow. 20. Repeat same for end of hanging loop. 1. Fold your ribbon in half to find the center. 2. Use a half hitch to secure it to lanyard hook. 3. Lace beads using pattern above as guide. 4. Finish by tying off with a double knot. 5. Add beads on both ends. 6. Tie off and trim. « Each row hanging down is a size 2 pin with “E” beads strung on it. « Open these pins and string beads following the pattern shown. Keep in mind that you are stringing the beads upside-down so you will start at the top of each row and work down. « Then turn the pin upside down. Use pliers to squeeze the pin head closed permanently. Note: Glass beads are irregular in size. It may look like the pins will not close, but as long as the tip shows, you can usually just press the point into the pin head opening. The pin will bend out slightly to fit the beads snuggly into place. « Open up the coiless pin. You will need to bend it open to at least a 60 degree angle to get the beads on. « Beginning with the beaded pin to the far right, thread the coil of that beaded pin onto the coiless pin, around the bend and over to the head of the pin. « Slide on a 4 mm bead. Then the next beaded pin, followed by another 4 mm bead. « Continue until you have threaded on all pins and finished off with a final 4 mm bead. « These beads help hold the pins in place and keep them from sliding around the coiless pin. · Have a boy sit in a chair or stand sideways to the wall about 1 foot away works well. · Have the lamp about 1-2 feet away from the boy. · Trace their silhouette on the black paper. · Have each boy cut out his silhouette. Alternate Method - If it is too hard to see the tracing on the black paper, then draw on white paper and put the black and white paper together to cut out black silhouette. « Put together a box with basic craft items. Some good craft items to have on hand are: foam sheets, stickers, felt, fabric scraps, scissors (both paper and fabric), pom poms, plastic canvas, empty egg cartons, empty cereal boxes, paper plates, brown paper bags (small and large), cookie cutters, plastic lids, glue (hot, white, tacky and stick), markers, crayons, colored pencils and tape (clear, masking, clear packing). Sites and buildings and people associated with that history. Try to learn about how the city got its name. Find out about the ethnic groups that live in the city and the influence they have had on the city’s culture. You could learn about the geography of the region the city is located in, such as the rivers and streams, mountains, coastlines etc. and how these features affected the city’s culture, economy and recreational activities. You also might want to learn about the cultural activities of the city such music, dance, theaters, museums, historical and ethnic celebrations, and the amusement parks the people living there enjoy. While you are at it, try to learn about the cities and towns you will be traveling through as well. « This can be an opportunity for a parent and or Cub leader to sit down with their cubs and learn about many other cites in America as well. Whether the city is the one they live in. It is the city that their parents, grandparents or other relatives live in or the cities where their ancestors once lived in. There is much to learn about. « Other places to learn about might include the nation’s capital, the various state’s capitals, or even places that you might have heard about in the news. « You could learn about places associated with important historical figures, important battles associated with wars fought on American soil or other important historical events. « You may even try to learn about a city you would to like visit some day. « This would be a good month to work on the citizenship, geography, and map and compass belt loops and pins and the Webelos traveler pin. Every patriotic youngster will went one of these model ship doorstops for his room. Our doorstop was inspired by the "Constitution," famed for her exploits in naval battles and affectionately nicknamed "Old Ironsides." · The hull of the ship is made from two half-gallon plastic bleach bottles. · Soak to remove labels and rinse thoroughly. · Remove an additional 1/2" strip across bottom of bottle. · Cut second bottle, as shown, for the stern end of hull. · Cut several pairs of corresponding holes in both sections of hull. · Overlap the two and tie together through holes, very securely. · Seal by joining with tape on the outside. · For guns, insert matchsticks in holes punched along sides of the hull, about 1" from top. · The "Constitution" had 44 guns. · For the three masts, use 1/4" dowels, making one mast 15" long and the other two slightly shorter. · Set masts in position in lumps of clay. · For the bowsprit, cut a 5" piece of a pencil or a dowel, tapering one end to a point. · Insert bowsprit into the neck of the bottle and tape to hold. · Paint masts and bowsprit. · Following directions on the package, mix a batch of plaster of Paris. · Fill the hull to within 1/2" of the top, being sure to cover end of bowsprit and partition between the two sections of hull. · When completely dry, paint hull and plaster deck. · For cabins, glue on one or two small cardboard boxes. · Punch a hole top and bottom of each sail. · Now slide sails onto masts through holes, largest sail first, graduating sizes. · Push paper sails down gently, so that each curves outward, as if blown by the wind. · Attach a triangular sail to the bowsprit. · Take a length of string and run through fold, leaving extra string at each end. · Paste sail together with string inside. Tie sail to bowsprit and to forward mast. · Cut anchors from the sides of plastic bottles. · Attach to ship with string through holes cut in bow of ship. · For lifeboats, cut 1/2" x 1 1/2" pieces from curved side of plastic bottles to correspond to lengthwise curve of boat. · Overcast pieces together with needle and double thread. · Insert matchstick pieces for seats. · Use fine wire to form hooks, as shown, to suspend lifeboats on side of hull.